Platform promises robo-advisor tools and efficiency to allow advisors to serve current clients and attract prospects; will be a practice management option for Fidelity RIAs. Betterment, the four-year-old robo-advisor, announced Wednesday the launch of Betterment Institutional, which will provide advisors with a self-branded, automated platform to serve existing clients and attract new clients with Betterment’s investing, tax harvesting and automated rebalancing offerings. Jon Stein, the founder and CEO of Betterment, said in an interview that Betterment Institutional, or BI, “brings the power of Betterment to more people,” partnering with advisors who want to leverage BI’s technology solutions in their practices. Betterment has formed a “strategic alliance” with Fidelity Institutional Wealth Services (IWS), Stein said, which David Canter of Fidelity IWS said reflected the RIA custodian’s deep interest from a practice management standpoint in educating its RIAs about the benefits of using technology to improve their practices. “Having looked at their platform, it’s exceptional from an advisor standpoint,” he said. “It drafts off the business to consumer orientation” of Betterment’s offerings, but “with advisors as the hub” of the relationship with the investor. Betterment Institutional will become one of the practice management tools that Fidelity IWS offers to its RIA clients and prospects. Since its founding in 2010, Betterment has attracted 50,000 customers to its automated advice platform, Stein says. Stein said 25 advisory firms have been beta testers of the Betterment Institutional platform, and an additional “800 to 1,000 firms” have expressed interest in adopting the platform. How does the platform work? 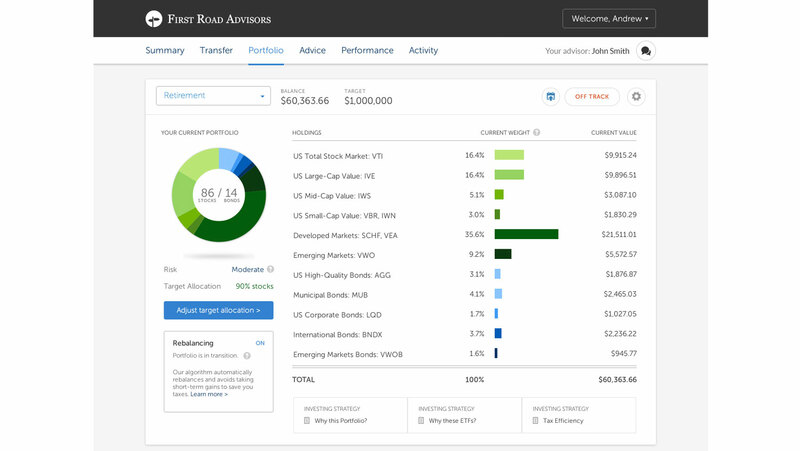 For the advisor, BI provides a dashboard (see screen shot) that allows the advisor to view and manage existing clients and their assets on the platform. The advisor uses the dashboard as well to invite prospects to sign up for the platform, which Stein said can take as little as 10 minutes to complete. Betterment provides the engine for the platform, but everything the client sees is branded with the advisor’s name and logo. The platform provides collaboration tools like WebEx and JoinMe, and gives advisors the option of “co-browsing” with their clients, so that the advisor sees what the client sees on the client version of BI at the same time. After the advisor invites the client to join the platform, “the experience from start to finish is electronic,” Stein says, including onboarding of a new client. “There’s never any paperwork or signatures,” says Stein. 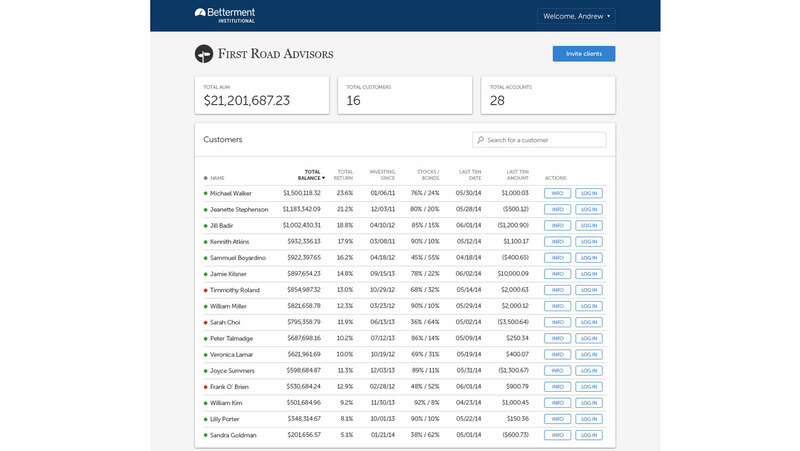 As seen in a demo of the BI platform by Betterment product manager Nick Gavronsky, Betterment’s investing offering is based on specific client goals, and the client (and advisor) sees whether the client is “on track” toward his or her goals through a simple red or green light. The advisor dashboard, Gavronsky says, shows total assets under management on the platform, the number of clients and the specific accounts. It also shows if the client has added funds to his account and allows the advisor to set his fee for each account. As seen in the screen shot below of what the client sees, through a couple of clicks on the client’s view of the platform, clients can electronically transfer funds to the Betterment platform, and can also upload pertinent financial documents to the site, such as tax documents, that are available to the advisor. Advisors working with clients can adjust their goals as circumstances dictate, or choose a different investing model as goals change. Again, the client view is branded with the advisor’s name, and includes the advisor’s contact info. Canter said that his research shows that for robo-advisors now, the “average client age is about 36” while the average amount of “client assets is in the neighborhood of $20,000.” For an advisor, by contrast, the average client is about 58 years old, and has assets in the $2-$10 million range. “We’ll pay attention as advisors use this solution,” Canter promised, to tease out best practices and results. Check out Liftoff! Joshua Brown on Ritholtz’s New Advice Platform on ThinkAdvisor. Americans Are Confident About Their Finances. Retirement? Not So Much. A Fidelity survey explored why Americans are uncertain about their financial futures.